This contest is now closed! but you can still read on, find out what it was all about. 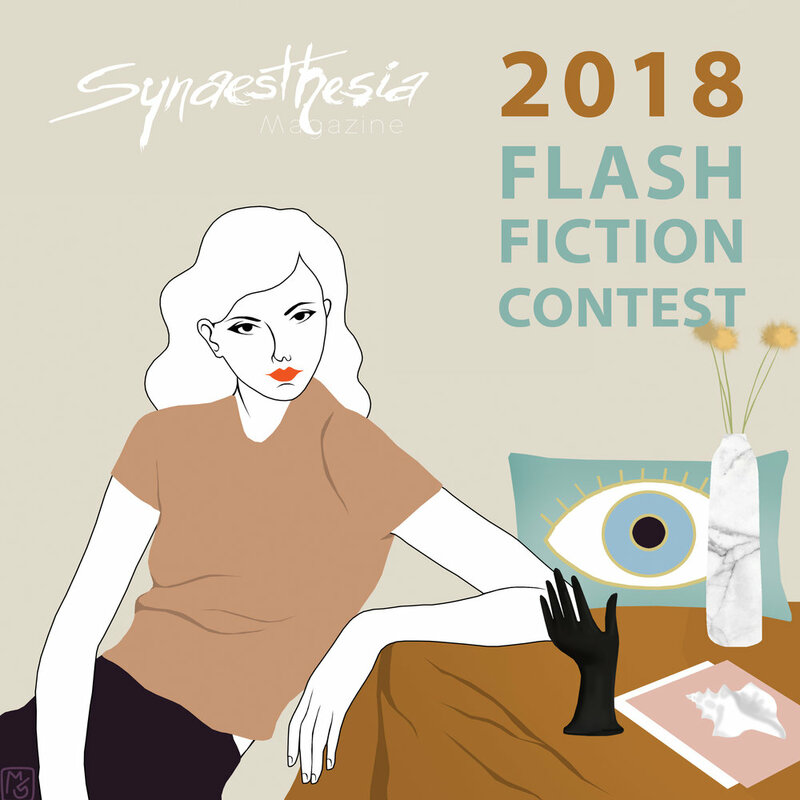 The 2018 Synaesthesia Flash Fiction Contest opens on Wednesday 18 July 2018 at 00:30 and closes on Sunday 6 August 2018 at 23:30 (BST British Summer Time). Entries will only be accepted via our Submittable competition categories. Please do not email submissions as our inbox gets super full – and they will not get read! For this contest, flash fiction counts as no more than 500 words. (If you go over a bit, we won't be mad – but we probably won't accept a 700-word story, it’s only fair.) We will only accept unpublished stories; simultaneous submissions are welcome, although entry fee refunds will not be given. Entry fee per story is £5. You may submit a maximum of two stories. (We really want to hear from a whole range of writers.) The entry fee allows us to cover the cost of the prizes. If we make more than enough, we will up the prize money! If we do not make enough, our editors will cover the remaining costs out of their own pockets. What format shall I submit? You can submit file types: .doc, .docx, .pdf, .txt. Please do not put your name or any identifying information anywhere on your document, as all entries will be read blind. If you do, your submission will be disqualified – we want to keep things as fair as possible. Nope! Just great flash fiction, and we ask that you bear the senses in mind in your writing. Think with your fingers and toes. We want to see concrete imagery and tasty sentences. Anyone! You don't have to be based in the UK to enter. However, we only accept stories written in English. And we ask that stories have not yet been published elsewhere. Simultaneous submissions are fine, but we will not be able to offer a refund if your piece is accepted elsewhere. Finalists and winners will be announced in autumn 2018. (All finalists will be contacted before the reveal.) All of our finalists will also be considered for publication. Winners will be published in our next issue, SHORT SHORTS. wait, WHAT IS SHORT SHORTS? SHORT SHORTS is our next themed issue – and also happens to be our 20th anniversary issue! – in November 2018 [Ed Note: You can now read it here]. All winners will be published in SHORT SHORTS and normal submissions will open after the flash fiction contest closes. When will you let me know if I've made it? Please allow up to two months for us to get back to you. Ideally, we will get back to you before then – but this gives our editors and judge the time and space to consider each entry carefully. The best question. Check out our blog for all the prizes. THE CONTEST HAS CLOSED AND SHORT SHORTS IS OUT. WHERE CAN I READ THE WINNING ENTRIES? We’re glad you asked! You can read the winning entry, SO MANY PEOPLE by Tania Hershman; the 2nd prize story, A FAMOUS SCANDAL AT WORK by Conor Houghton; and the 3rd prize story, LAMBS by Melissa Goode, all in our SHORT SHORTS issue pub’d in Nov-Dec 2018. Happy reading.